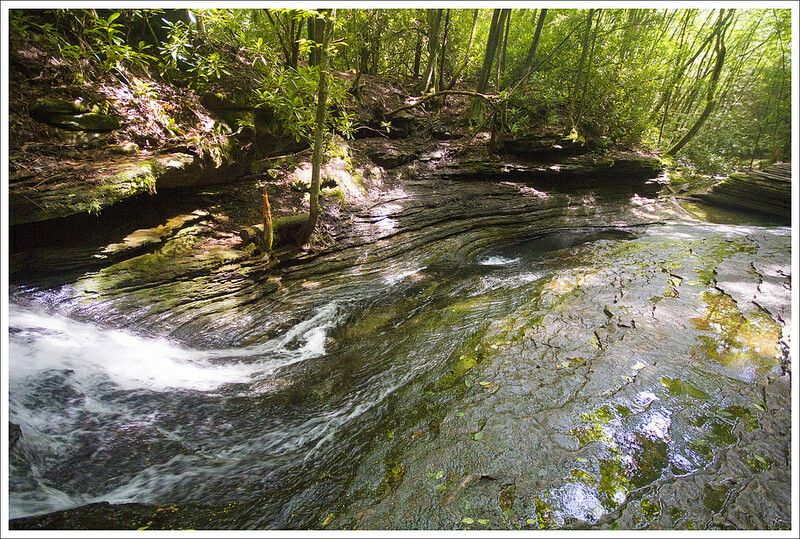 This 3.6 mile hike takes you over more than 15 water-crossings to see a series of small waterfalls and swimming holes. 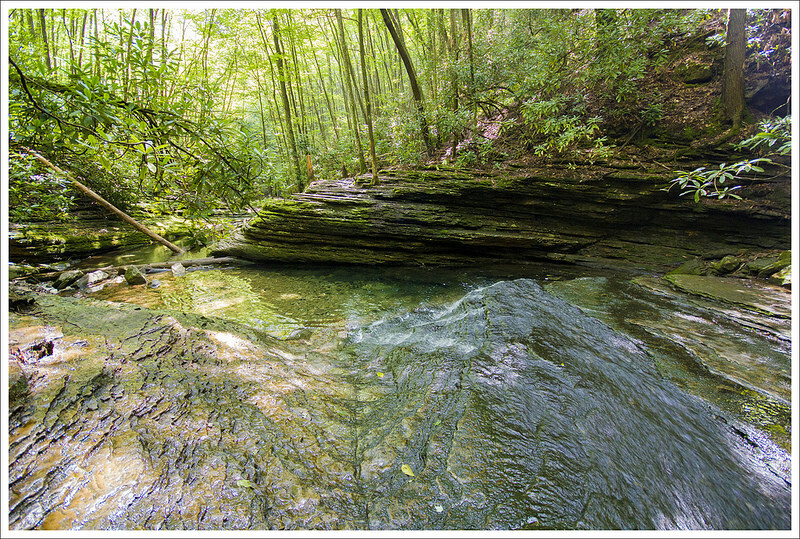 The main scenic draw of this hike is the visit to the Devils Bathtub – a beautiful sandstone formation in the streambed. 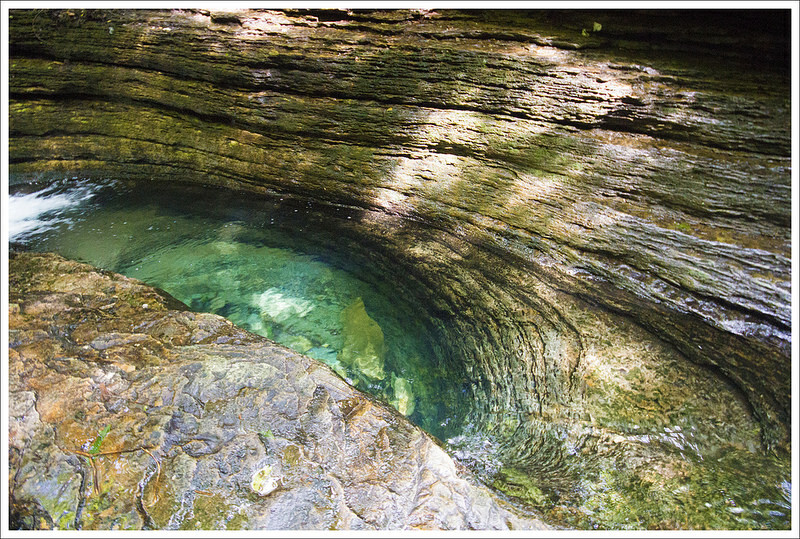 The Devils Bathtub is a perfectly clear, oval pit in the sandstone. It really does look like a bathtub! When we visited the water levels were very low. Normally the striated area above the tub forms an even larger pool. 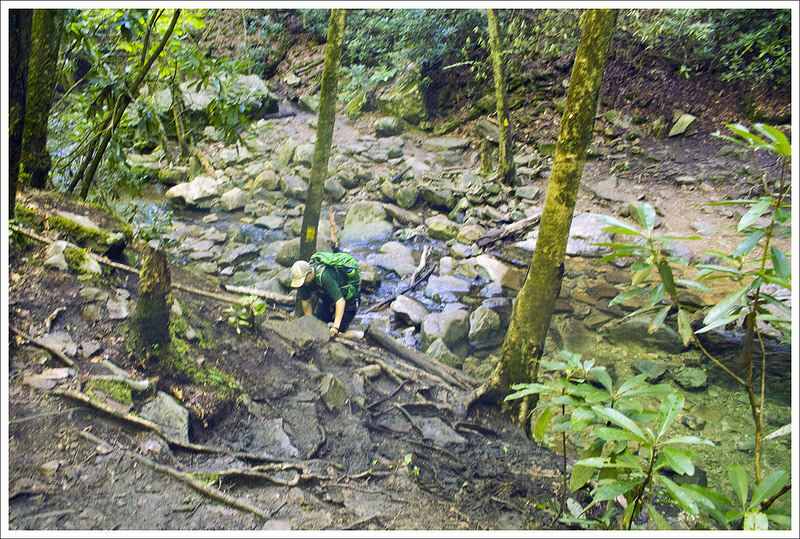 Below: Stairs at the beginning of the hike; First water crossing; Early part of the trail. The Devils Bathtub popped up on our radar after getting quite a bit of attention on the internet. Sometime after 2014, it started showing up on Pinterest, on Reddit, on lists of most beautiful places in each state – even the Weather Channel called it Virginia’s hidden gem. As dedicated hikers, we wondered how such an amazing place could have escaped our notice for so long. As it turned out, this hike has been hiding in our plain sight for years. 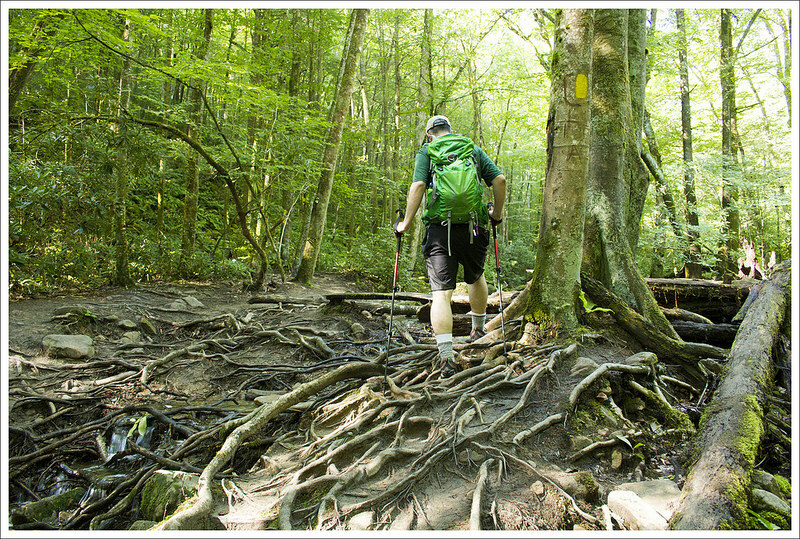 The route to the Devil’s Bathtub is fully outlined in Bill and Mary Burnham’s ‘Hiking Virginia’ guidebook as part of the larger Devil’s Fork loop. Burnham’s description of the scenery was far less dramatic than accounts we read on the internet. And, we’re rarely in the far southwest corner of Virginia, so we stayed in the dark like most outdoorsy Virginians. However, on our summer trip to the Abingdon area, we finally had a chance to find out first-hand if the Devil’s Bathtub lived up to its internet hype. 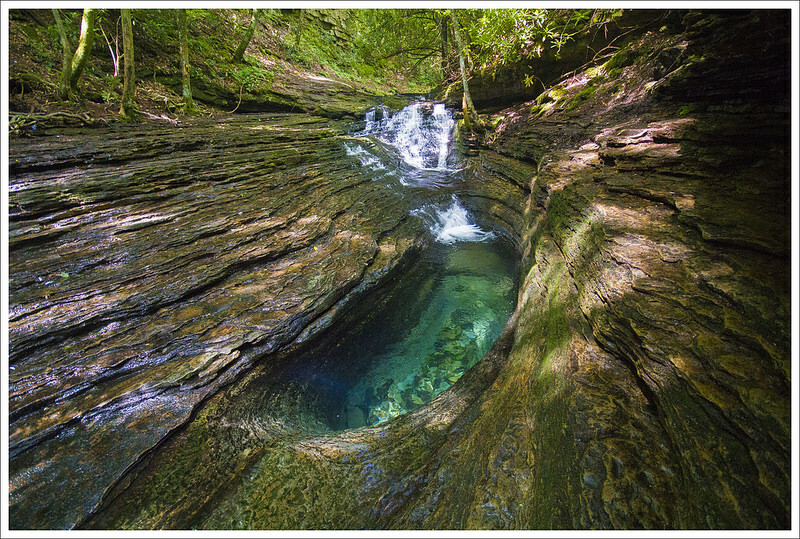 First off, the Devil’s Bathtub is in the middle of nowhere in Scott County, Virginia. There isn’t a nearby gas station to ask for directions or use the restroom. You probably won’t have any cell service, so make sure you have good directions and all your trail information ahead of time. Second, the last bit of road to get to the trailhead parking is quite rugged with mud and deep potholes in the road bed. Our Subaru did fine, but it was a bumpy ride! Third, parking for this hike is extremely limited with room for just a few cars. We visited early in the morning on a quiet, overcast weekday, so there was just one other car when we arrived. We’ve heard parking can be a nightmare for this hike, so time your visit strategically. Once we got past the logistical challenges – location, road access, and parking, we were all set to see this spectacular beauty spot! The hike started at the top of a staircase at the top of the parking area. At the top of the stairs, follow the trail to the left, passing almost immediately under/around a locked metal gate. 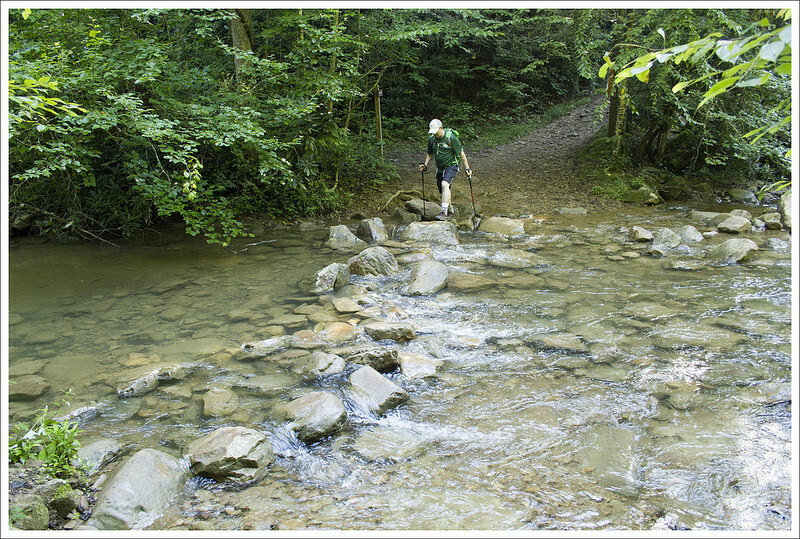 In just a quarter mile, you’ll have your first of many stream crossings. The first crossing was the widest and deepest we experienced on the hike – and we visited during drought conditions. During periods of heavier rain or snow melt, this stream crossing could be quite a bit deeper and wider. Shortly after the first stream crossing, you’ll reach marked split in the trail. You’ll want to bear to the left, following the arrow in the direction of the Devils Bathtub. The sign says it’s 1.8 miles to the Bathtub, but our GPS calculated the hike at almost a full half mile shorter by the end of the round trip. This route is also the most direct way to the scenery and is an out-and-back hike. There is a full 7-mile loop of this area, but all recent accounts say that most of the trail is poorly blazed, covered with blowdowns, and beset by aggressive wasps. After the junction, we continued along following the yellow blazes. Even though the trail doesn’t climb much in elevation, it still provides challenges with its sporadic blazing and 15+ water crossings. It was really easy to lose the yellow blazes, as the trail is eroded and appears to have been relocated several times. We made our way by carefully looking for yellow blazes any time the trail wasn’t abundantly clear. We were lucky to visit in a time of low water, so all of the water crossings were easily passable. I imagine the way could be really tricky when there is more rain. We passed a neat cliff-side that looked like it was built out of block. It was set off the trail, about 20 feet into the woods. Shortly after the cliff, the trail dipped down along an eroded bank next to the stream. There was a rope fixed to the uphill side of the trail to make passage a little easier. 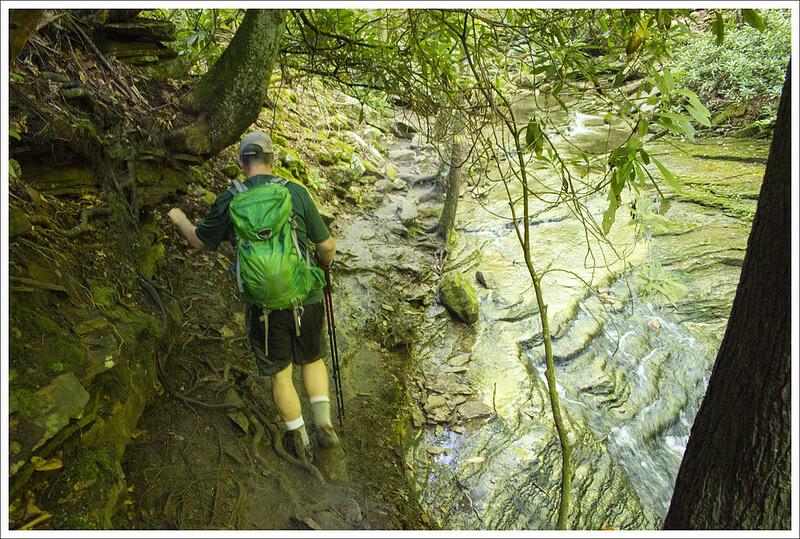 At the end of the rope, we reached the beautiful sandstone streambed that makes this area so popular. The trail crossed the stream one final time at the base of a large pool with a small waterfall. I imagine a lot of people reach this point and think it’s the Bathtub. It’s a pretty spot with deep, clear green water. But, to get to the Bathtub you should continue along the trail up a short but very steep scramble up the bankside. 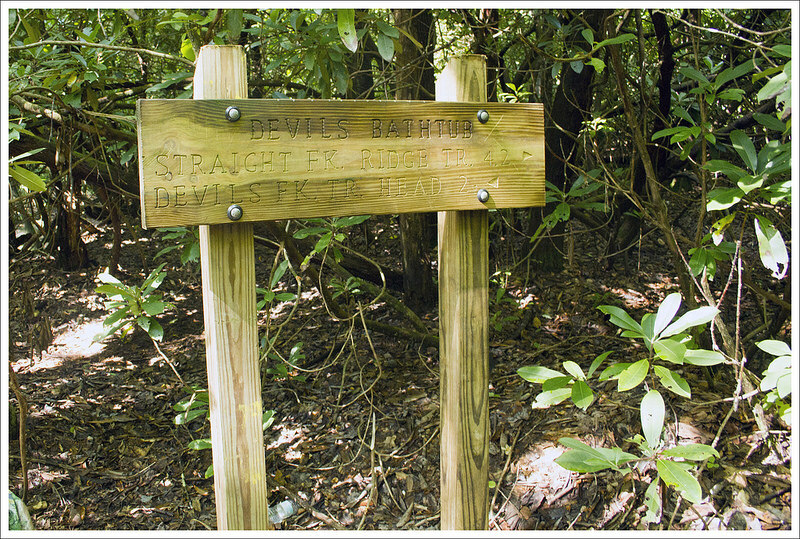 At the top of the bank, a newer wooden sign indicates that you’ve reached the Devil’s Bathtub. If you follow the footpath down to the stream’s edge, you’ll find the formation at the base of another small waterfall. It’s a gorgeous spot, though smaller than I expected it to be. The water was low on our trip, so I’d say the tub was only about half full! 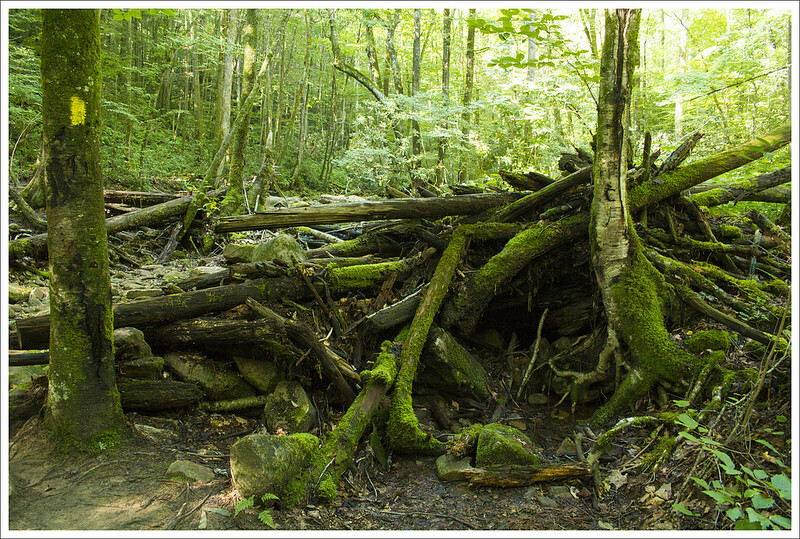 We explored and photographed the area for a while… dismayed by the enormous amount of garbage left behind by other hikers. We saw dirty diapers, Styrofoam cups, beer cans/bottles, tampon applicators, sodden socks, discarded t-shirts, empty pudding cups, a spent asthma inhaler, and countless cigarette butts. I simply can’t understand how a person can visit such a naturally lovely place, and feel alright about leaving their trash behind. Adam and I ended up carrying out three bags of garbage, and it didn’t even make a dent in what was still left behind. After a while, a couple more groups of hikers joined us at the Bathtub, so we decided to pack up and make our way back to the car. To exit, we simply retraced our steps. On the way out, I kept thinking about all the litter we saw on our hike. If you choose to do this hike (and we hope you will) please bring a trash bag and help clean up along the way! This is a gorgeous area – but it’s overused and fragile. A friend of mine had asked me about a year ago if we had hiked Devil’s Bathtub yet. After checking out pictures online, I knew this is one we had to put on our radar. Living several hours away and the fact this is a short hike made our decision to incorporate this hike into a four-day trip to check out a bunch of hikes in southwest Virginia. 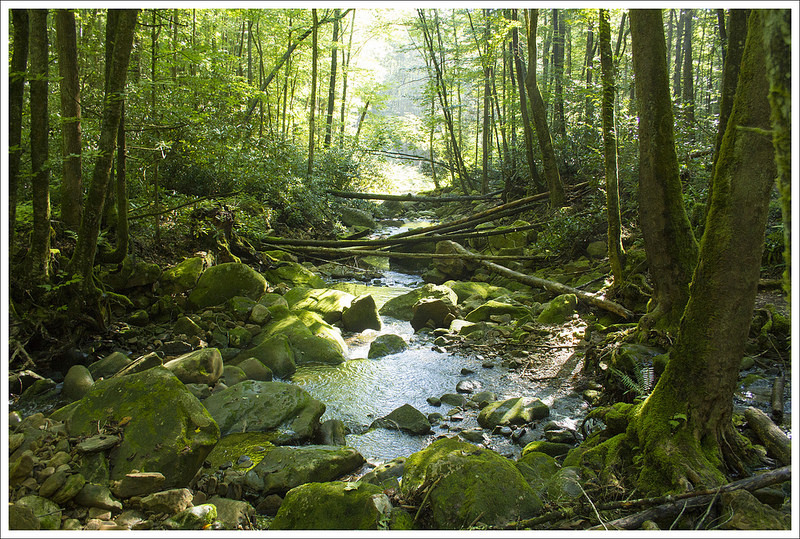 This hike does have some challenges involved – navigating to parking without reliable GPS signal, the bumpy drive on the fire road to get to parking, the often poor blazing on the trail, and the numerous stream crossings. But with a little determination, we found our way to this gorgeous spot. From the parking lot, we heading up the short flight of stairs where we met the trail. There are no signs to say which way to go, but we took a left at the top of the stairs and found we were correct. The yellow-blazed trail leads to a gate and passing through, the trail leads down to your first of about 15 stream crossings at .15 miles. When we went, the water was at a low level, so if you are hiking when there has been a lot of rain, expect your feet to get wet and plan to do a lot of rock hopping. 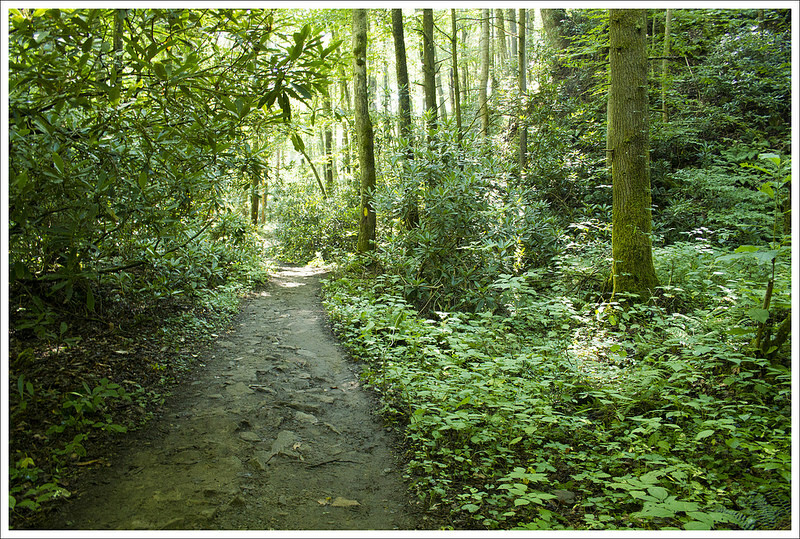 At about .2 miles, you reach a junction with the straight fork ridge spur trail. Bear left to stay straight on the trail. The Devils Pool. 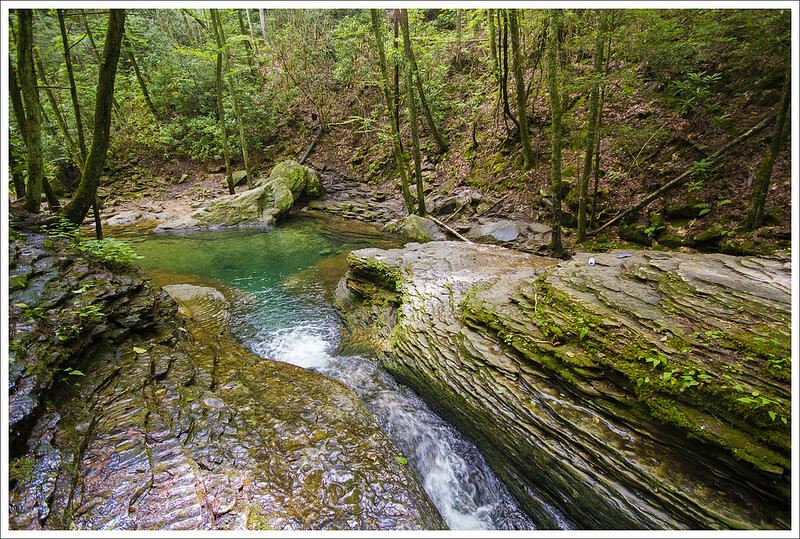 Below: Small cascades; Pools along the stream. At .7 miles, we reached the first of the hard to navigate sections. We approached this larger creek section and saw some blazes straight ahead, but also to the right of us. We went straight ahead and up a steep bank that went down a steep, slick hill back to the creek, only to realize this section had been re-routed. We went back to the original spot to cross, bore right to the larger fire road and found the blaze to continue on the trail. At .9 miles, at the fifth stream crossing, we had a hard time finding where the blazes continued. 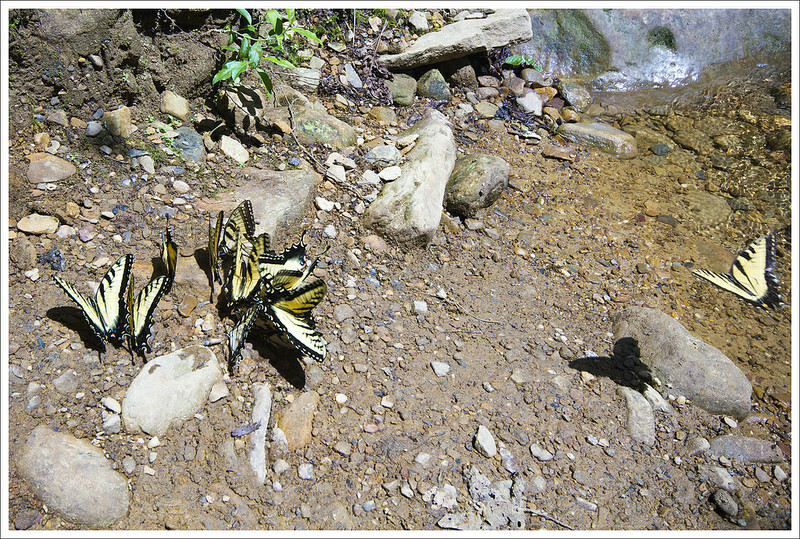 We reached the large stream bed and rock-hopped and walked ahead on the creek about 75 yards before finding the yellow blaze going up a steep bank to the other side. Our instincts led us the right way, but the lack of blazes made this an unnecessary challenge. We got back on the trail and just a little over a tenth of a mile, we were standing above a swimming hole, looking down to the left. From the trash and abandoned clothing left behind, we could tell many people have taken a dip in this spot before. Continue on the trail and continue to cross the stream several more times. 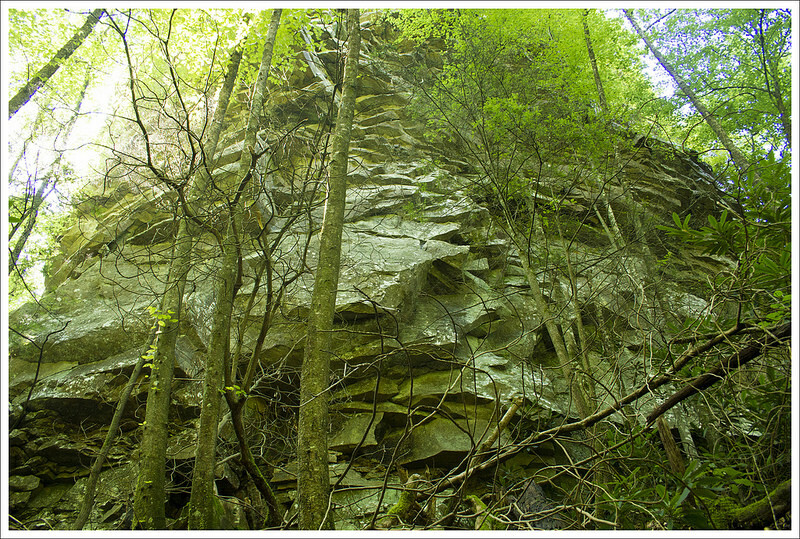 At about 1.5 miles, the trail reaches a large rock formation and you scale the side of it on a narrow path, but with some assistance to an anchored rope that guides you along. 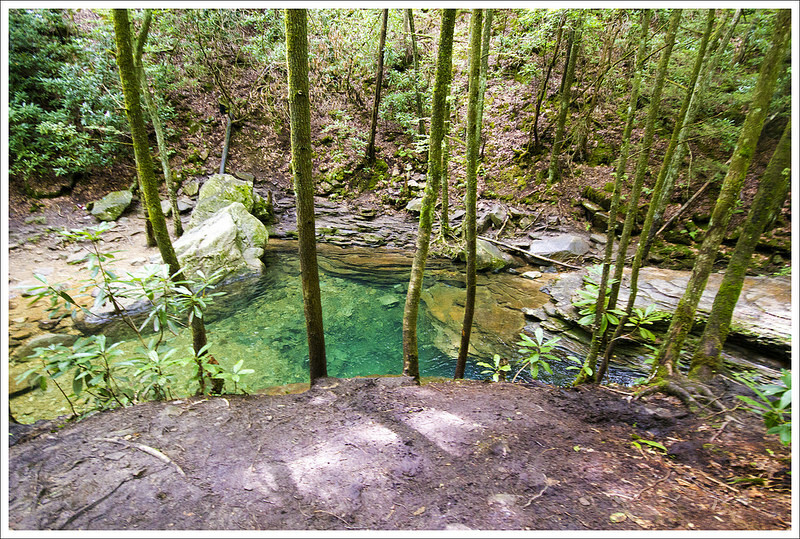 You then climb down to a stream crossing and swimming hole before making your way up a very steep bank to continue on the trail. 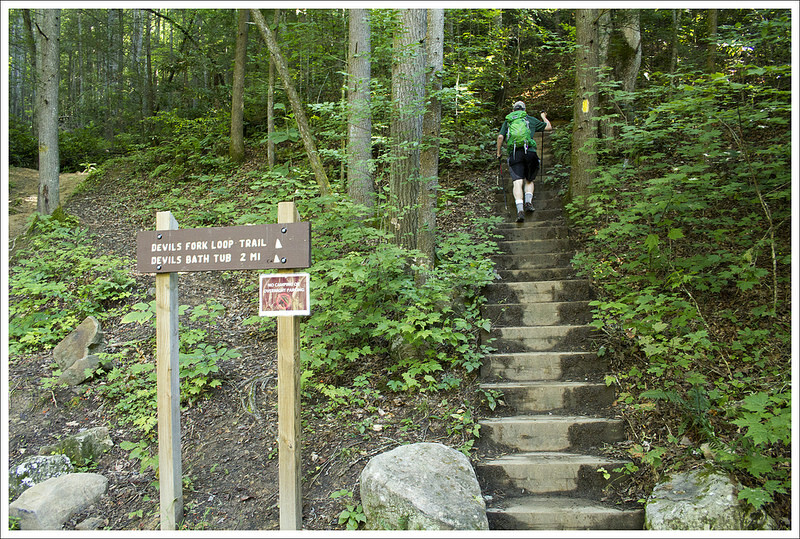 From here, the hike is relatively flat and at 1.7 miles, you reach the sign for Devil’s Bathtub. There is a small lookout over the bathtub from here, but if you want to see it up close, the best thing to do is continue past the sign and stay on the trail. When you reach the stream again, cross it and then navigate along the side (the rocks were very slippery here) until you make your way down to the bathtub at 1.8 miles. The water again was low, so we were expecting a deeper basin of water from what we have seen in some pictures. The rock around the bathtub was covered in algae and very slick, so be careful!! It took us a while to just remove enough trash around the site to get some decent pictures. As Christine mentioned, please bring a trashbag and help pick up around the area. The devastation of litter here made me quite sad that people would treat such a picturesque spot with such disrespect. We made our way back the way we came and saw a few people on our way back. 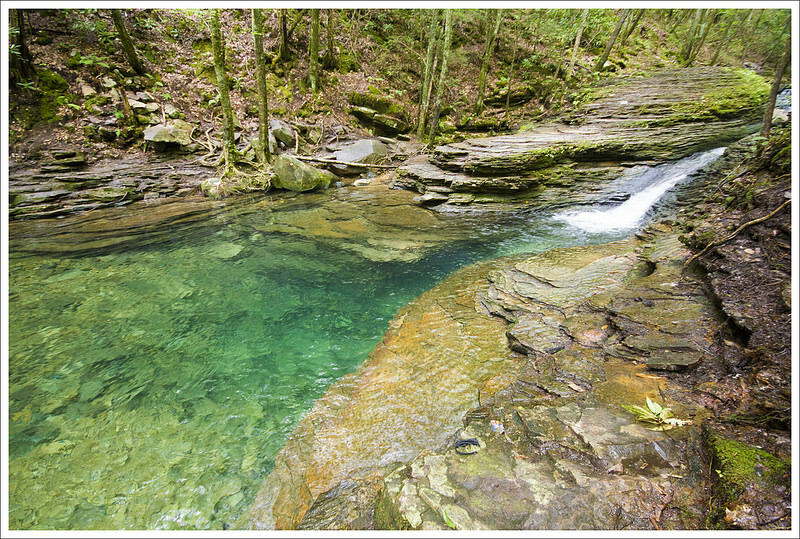 The green water plunging over and into the Devil’s Bathtub makes for one of those truly magical places in Virginia. 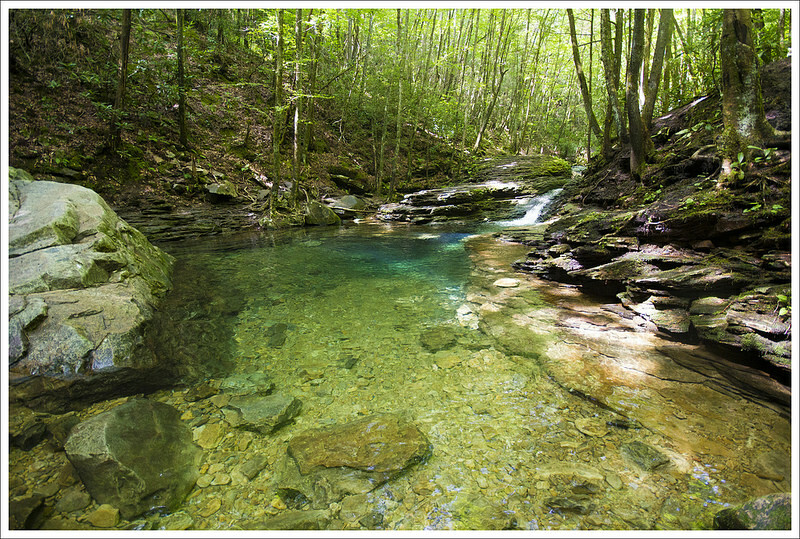 If you are ever down in the southwestern part of Virginia, put this on your must-hike list. Difficulty – 3. The climb is easy and very small/gradual. The challenge factor is increased by the number of water crossings you must negotiate. 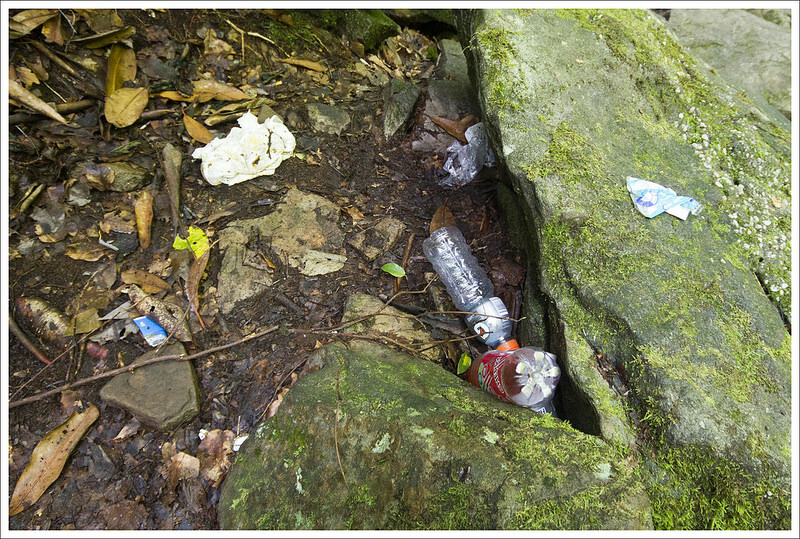 Trail Conditions – 2.5 The trail is eroded in numerous places and there is a real issue with litter. Views – 0. None on this hike. Waterfalls/streams – 5. The stream scenery is gorgeous! Wildlife – 2. 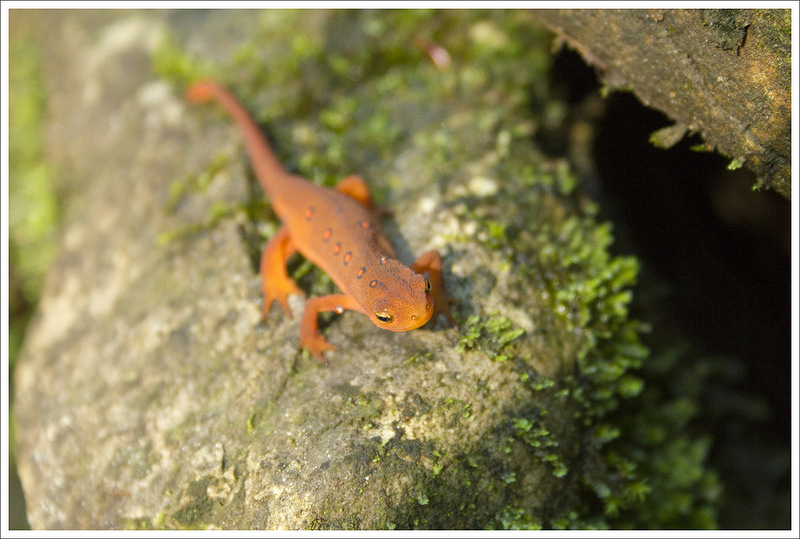 We saw lots of newts. Ease to Navigate – 2.5 The trail is poorly blazed and hard to follow in several spots. Solitude – 2. We visited on a quiet weekday, and still saw multiple groups of people. Directions to trailhead: Parking coordinates: 36.819106, -82.628852. This location is very isolated and not really close to anything. It’s best to use the GPS coordinates and navigate fro=m your home direction. 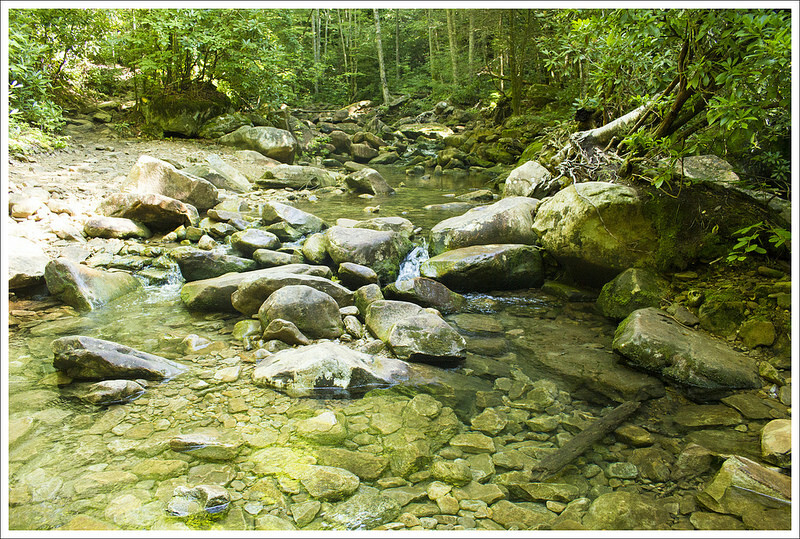 If I were to park along side the creek before getting to the sharp turn that takes you up to the High Knob, about how far of a round trip hike is it to the Devils bathtub using the left trail? And how far is the round trip using the right trail? Do you think a 6.5 year old girl can make the terrain with her parents of course? When we hiked, water levels were low and I think most fit children would have been fine and had a blast crossing the stream. A less fit child might struggle. I also think the hike would be much more challenging, possibly dangerous, when there has been lots of precipitation. I guess my best answer is… it depends! I started hiking with my 7 year old granddaughter last summer. She had no problem with the moderate hikes I took her on and she really enjoyed them. I hiked devils bathtub last year and now I know that she would’ve had no problem with it. I plan to take her back this summer. When I went the water levels were low. – should I wear my breathable, lightweight, mesh hiking boots? Or go with my waterproof shoes? – I want to be comfortable and not worrying about my feet for this trip. Thank You so much for your time and effort with the information. Hi Christopher – August can have lots of thunderstorms or be rather droughty. I’d keep an eye on the weather, but still plan for potentially knee-depth water crossings. I did the whole hike in lightweight trail runners. They did get wet, but they’re mesh-y and dry quickly. In case you haven’t gone yet, I hiked this trail yesterday. The streambeds were low and my feet didn’t get wet at all. Might I suggest on this and other hikes having a specific destination that you provide lat.-long (GPS) coordinates? In this case that would mean coordinates for the Devils Bathtub pool. Thanks. Love your blog. I have gone to this spot for years. Until 2014 no matter when you went, even in the dead of summer you would rarely run into a single person. Hurts to see all the litter. I haven’t been in about 2 years now because of how busy it is. Hopefully it can stay clean. Truly gorgeous spot though. We enjoyed an unusually quiet day on the trail when we visited, but the litter was really depressing. I hope bringing the issue up will encourage visitor to do a better job with ‘Leave No Trace’ in the future! My parents live in Marion. Looks like I have a new addition to the to-do list next time we’re down there.